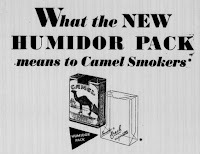 In the late-1940s a new idiom entered the language. It was a great idiom. It was the best thing since sliced bread. 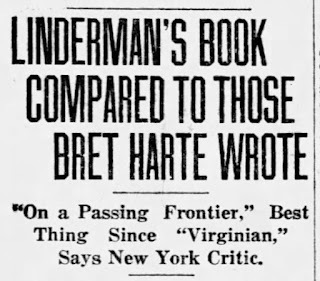 The Sedalia Democrat (Sedalia, Missouri), January 14, 1929, page 5. The Eugene Guard (Eugene, Oregon), July 12, 1931, page 3. 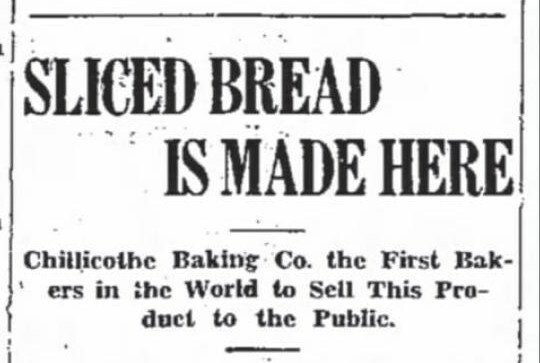 But the idiom, “the best thing since sliced bread,” did not emerge until nearly two decades later. 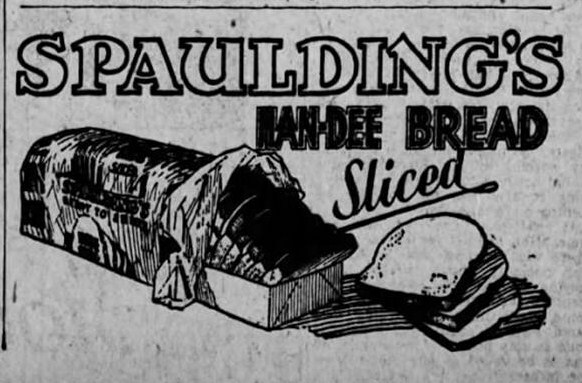 In the meanwhile, each new advance in bread-baking technology was compared to sliced bread. The News-Herald (Franklin, Pennsylvania), November 15, 1935, page 9. 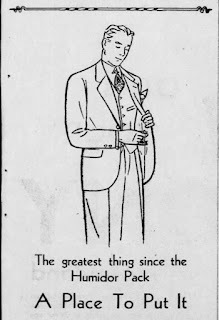 The Bee (Danville, Virginia), February 23, 1940, page 3. [H]alf-loaves of sliced bread are sealed into individual packages and then put together, with a “zipper” in between, for the final package, the greatest advance in the bakery business since sliced bread was introduced about 1927. 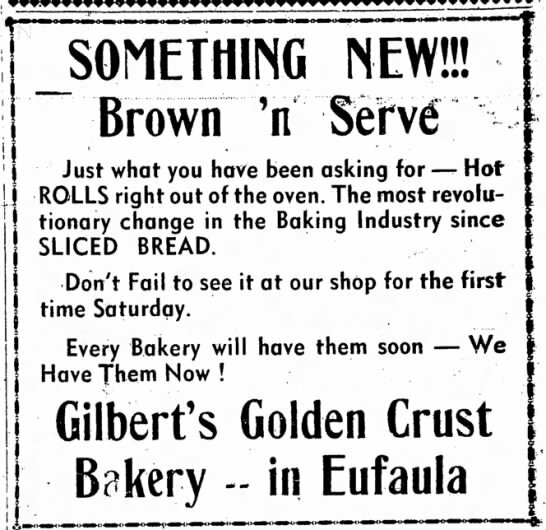 The Town Talk (Alexandria, Louisiana), July 26, 1947, page 12. 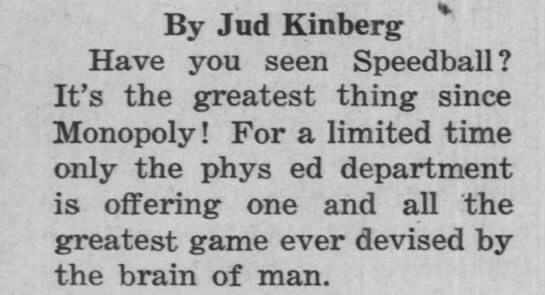 The Indian Journal (Eufaula, Oklahoma), November 10, 1949, page 5. 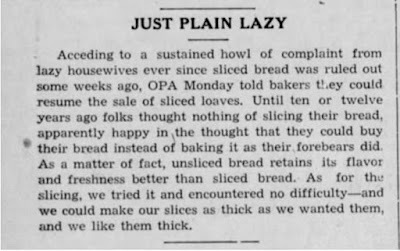 Sliced bread was so successful that people became lazy and spoiled. 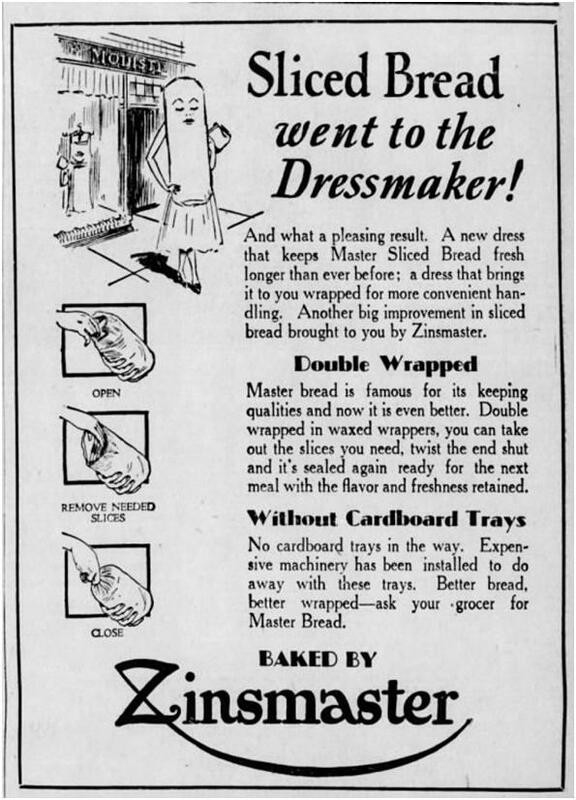 But they were quickly brought back to reality during the great sliced-bread revolt of 1943. 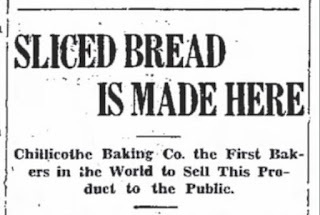 On January 18, 1943, the United States Agriculture Department ordered a ban on selling pre-sliced bread. 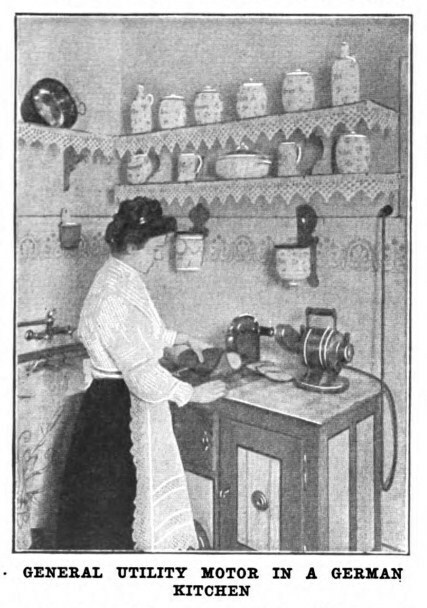 The regulation was apparently made for several reasons – to cut the cost of cutting blades in the bakeries, and to eliminate the inner wrapping . . . .
[But] to make matters worse, as soon as the present local stock of cutlery is exhausted there will be no more, due to a new government regulation to save steel. Some Bend firms report a run on knives since sliced bread went off the market. 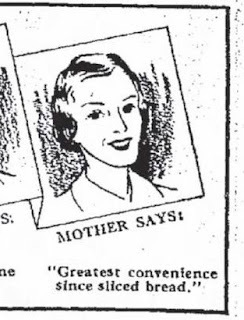 The Bend Bulletin (Bend, Oregon), January 20, 1943, page 1. Officials said the decision to lift the ban was made after assurances from the war production board that the paper and wax supply situation “looks O. K.” for the next few months. . . . Many Grocers and housewives had appealed to the department to lift the ban. The Ogden Standard-Examiner (Ogden, Utah), March 8, 1943, page 10. The Whitewright Sun (Whitewright, Texas), March 11, 1943, page 4. 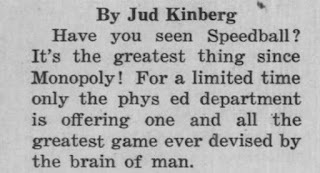 The Morning Herald (Hagerstown, Maryland), January 15, 1946, page 22. Apart from this single, isolated instance, I could not find another example until four years later. 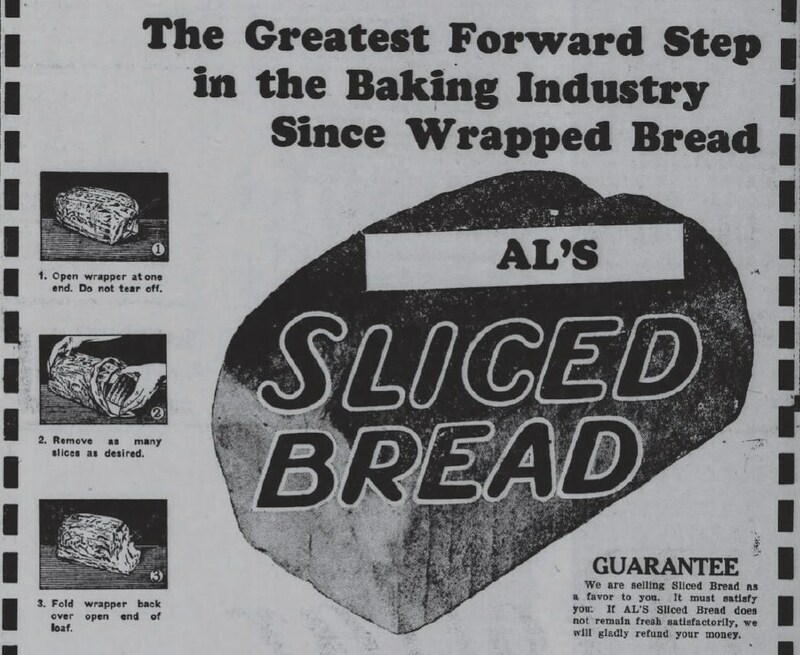 There was no sign at the time that “sliced bread” would eventually become the gold-standard of innovation. 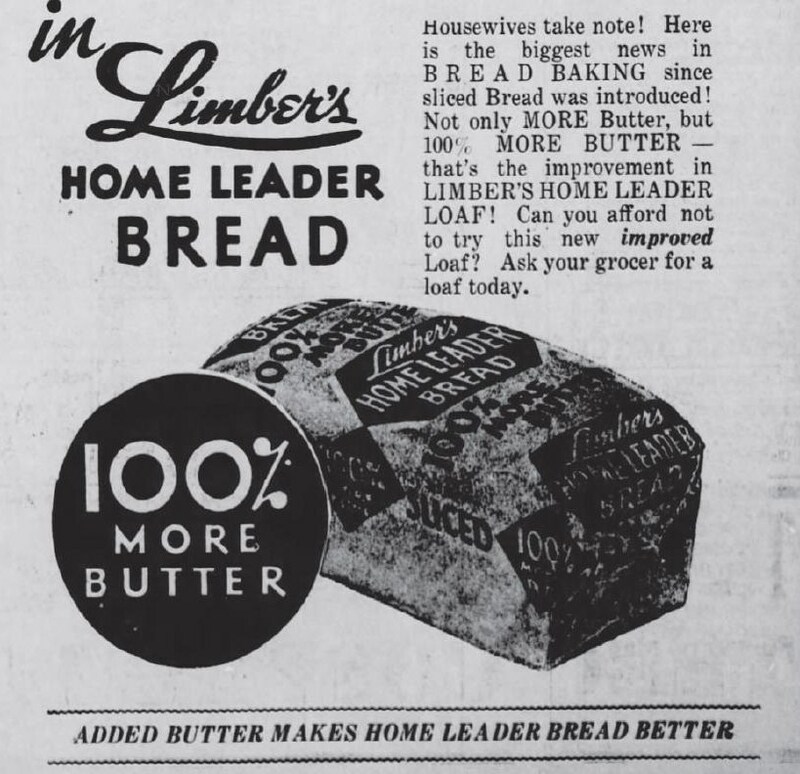 And in any case, the form of the expression, “the best thing since [fill in the blank],” was a well established advertising cliché long before Otto Rohwedder perfected pre-sliced bread, although for the most part, such comparisons related in some logical way to the product being advertised. 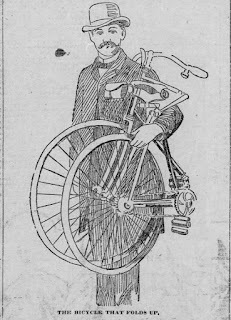 An advertisement for folding bicycles, for example, described a folding baby carriage as “the best thing since the jointed fishing rod” – and a folding bicycle was even better. 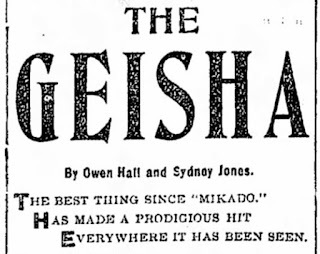 Saint Paul Globe (Minnesota), June 30, 1895, page 16. 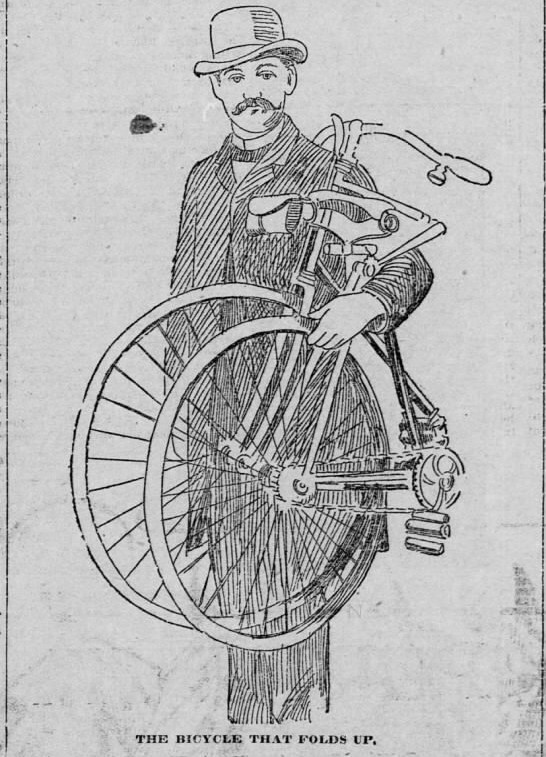 Detroit Free Press (Michigan), April 4, 1897, page 23. 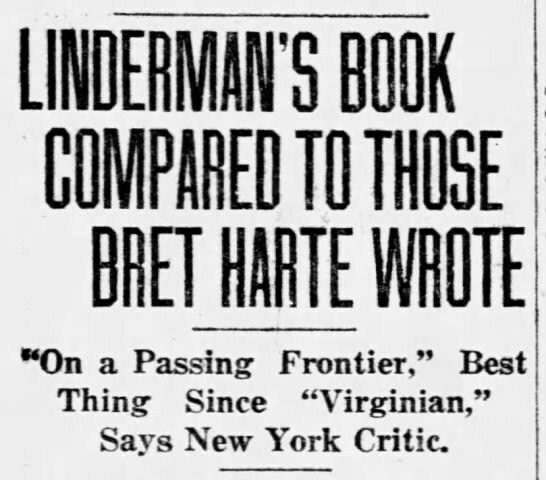 Great Falls Tribune (Great Falls, Montana), July 5, 1920, page 4. Daily Tar Heel (Chapel Hill, North Carolina), January 13, 1943, page 2. 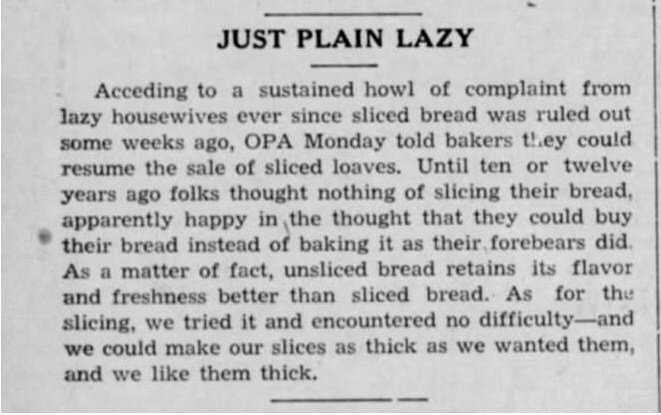 Bristol Daily Courier (Bristol, Pennsylvania), March 9, 1931, page 3. 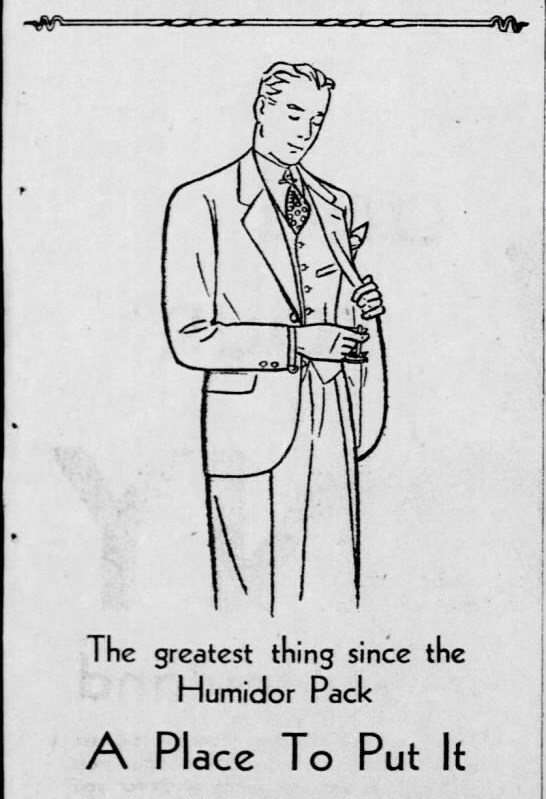 The Burlington Free Press (Burlington, Vermont), October 15, 1931, page 17. 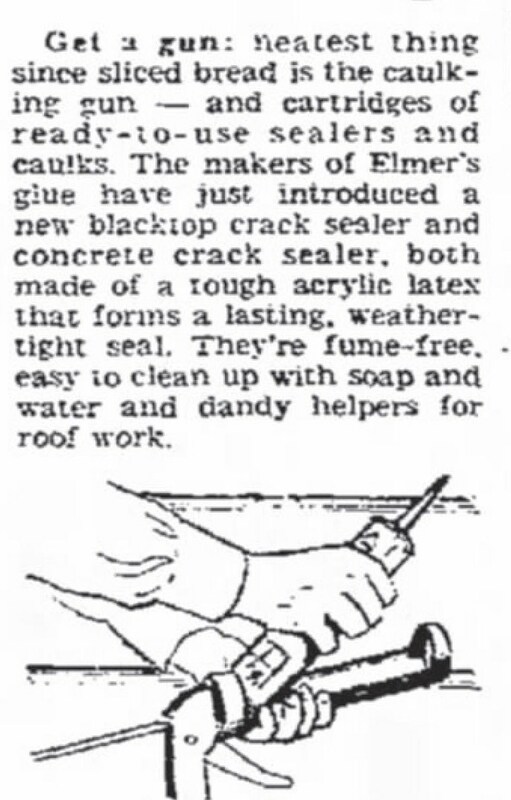 Pittsburgh Press (Pennsylvania), February 17, 1946, page 38. “Greatest thing since rubber gloves,” Mr. Hare said solemnly, commenting on Mr. [Milton] Berle. “Greatest thing since 7-Up,” the lady songwriter added. . . . The lady songwriter announced at this point that she had cooked a 25-pound turkey on Thanksgiving Day. We all raised our eyebrows politely and said “My!” enthusiastically. I didn’t think this was exactly the right spot for another “Greatest thing since,” so I kept silent. . . . Finally it was time to go. “I hope you enjoyed it,” Miss King said, uncertainly. I am not one to let an opportunity to slip by. “Greatest thing since rubber gloves,” I said, beaming, and I backed off into the normal, or dull, world outside. 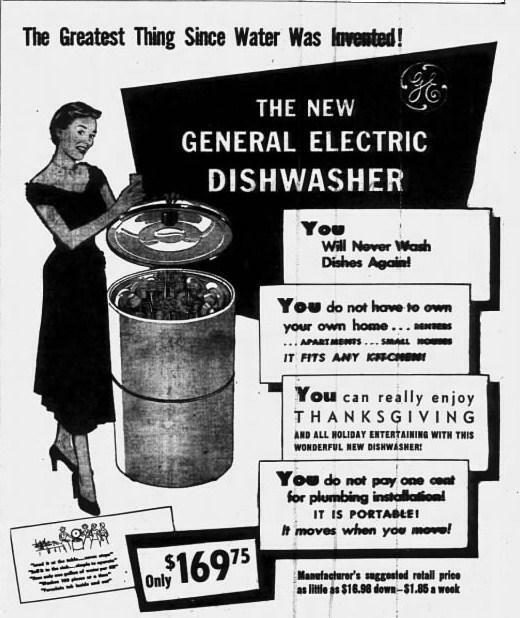 The Circleville Herald (Circleville, Ohio), December 8, 1948, page 6. By 1949, the over-the-top, exaggerated comparisons were everywhere. Oakland Tribune (California), November 14, 1949, page 15. 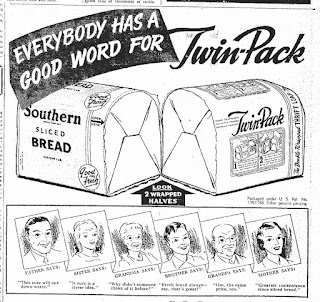 It is not clear whether “sliced bread” won out merely because of the widely familiar line of bread advertisements, or whether some person using the expression, or some event in which it was used, caught the public's fancy. 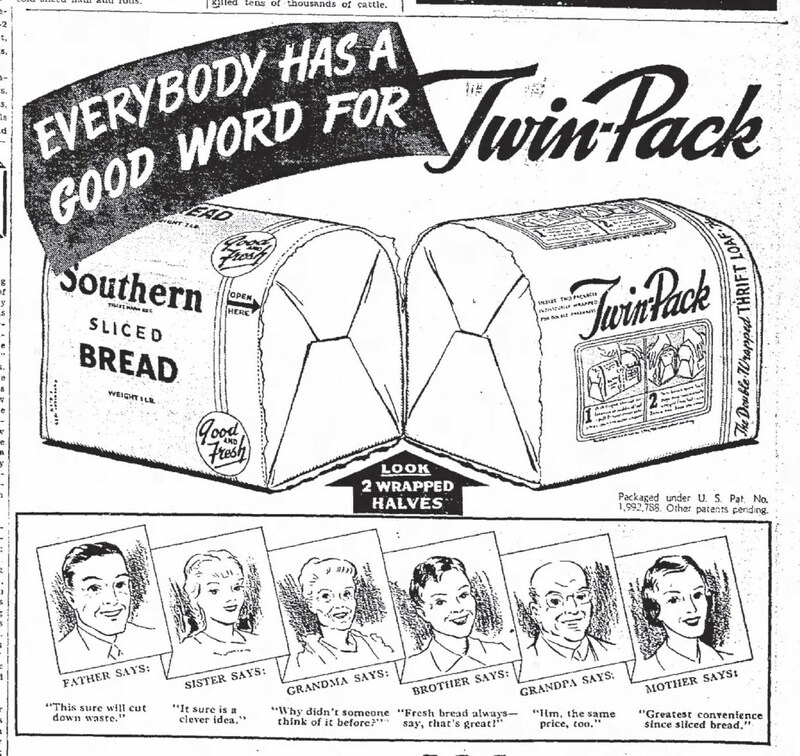 “Sliced bread” became a common point of comparison in 1951. This new zipper, of course, was not the first zipper – it was just an improvement on the old zipper. 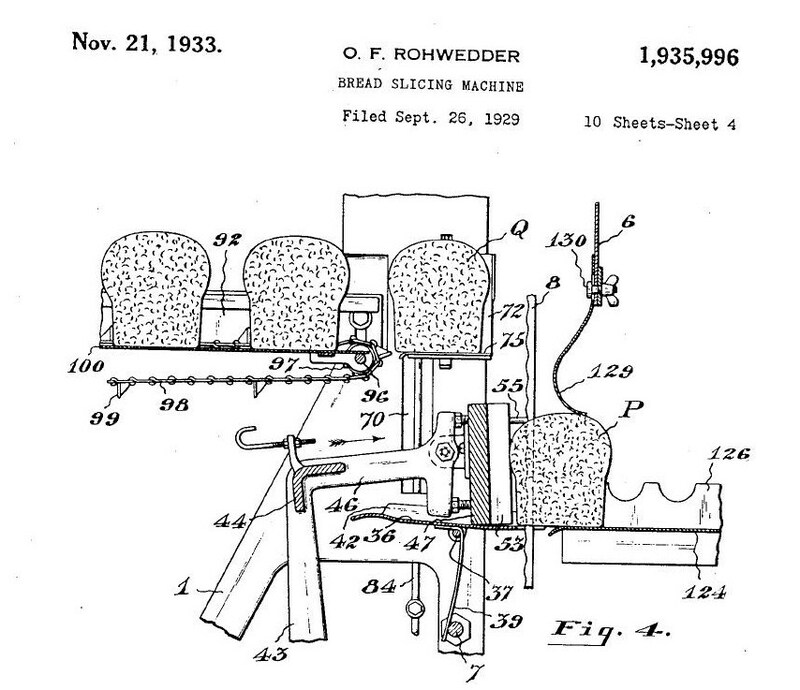 Similarly, Otto Rohwedder’s bread slicing machine was not the first bread slicing machine – it was an improvement over earlier designs. 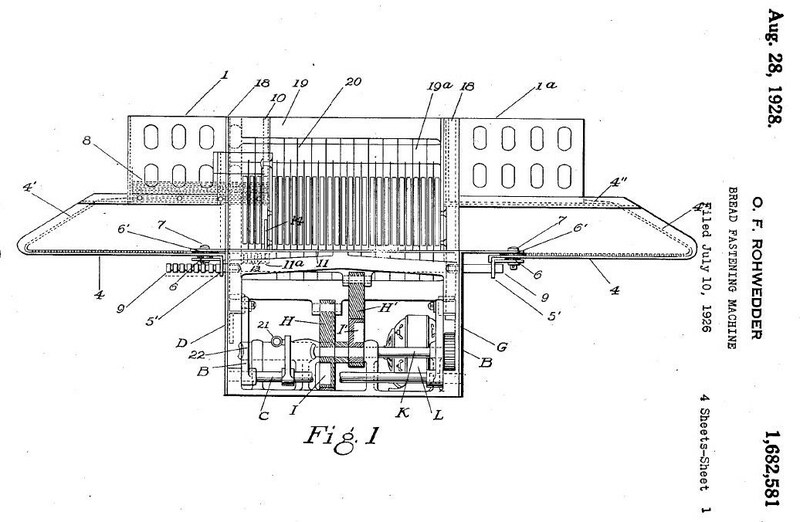 People had been trying to perfect an automated bread slicing machine for years without success, which makes Rohwedder’s overnight success in 1928 even more remarkable. Otto F. Rohwedder did not invent sliced bread. That honor probably goes to an anonymous, stone-age, hungry neighbor of the person who invented bread about 30,000 years ago – let’s say a hungry Fred Flintstone and a clever Barney Rubble. 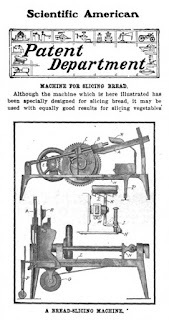 Mechanical bread slicers date back to at least the 1840s. 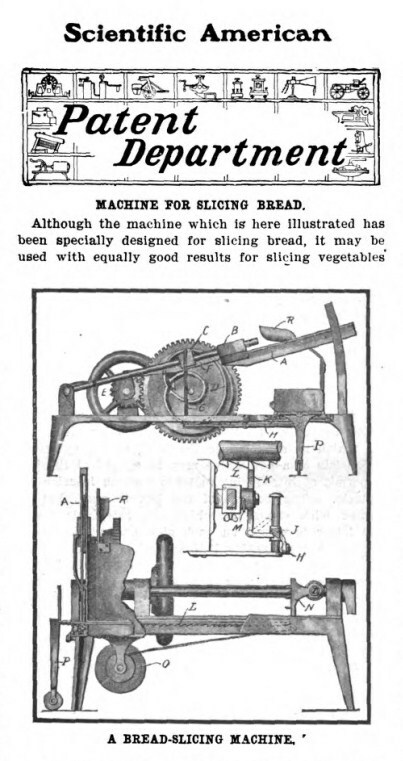 A new bread-slicing machine . . . slices an entire loaf at one operation without crushing, tearing, or breaking the slices. A number of knives, supported in two frames, are operated vertically and simultaneously but in opposite directions. When one set of knives is traveling up, the other set is traveling down. By this arrangement the friction in the slicing operation is counteracted and the softest and hardest baked loaf can be sliced equally well. 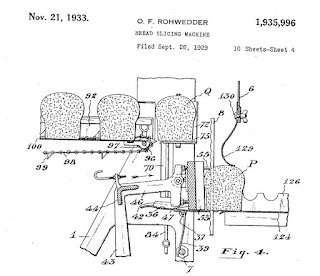 Mr. Rohwedder began work on his first bread slicer, intended for use in hotels and restaurants to slice one loaf of bread at a time, as a hobby while he was in the jewelry business. 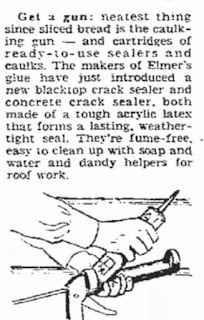 Battle Creek Enquirer (Battle Creek, Michigan), September 7, 1952, page 29. He abandoned his plans, however, when his first model was ruined in a fire and was not covered by insurance. Otto F. Rohwedder was born in Davenport, Iowa in 1880 and spent most of his life there. 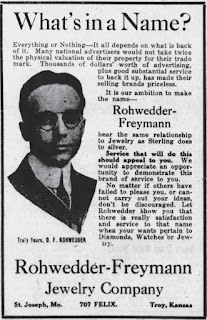 As a young man he learned the jewelry business working for Fred Bluer’s jewelry store across the river in Rock Island, Illinois. In 1901 he moved to LeMar, Colorado to manage another one of Bluer’s jewelry stores. He married Carrie Johnson in 1905 and they eventually lived in St. Joseph, Missouri where, from at least 1914 through 1916, he and his partner P. P. Freymann operated two jewelry stores, one on St. Joseph, Missouri and the other in Troy, Kansas. St. Joseph Observer (St. Joseph, Missouri), July 29, 1916, page 8. 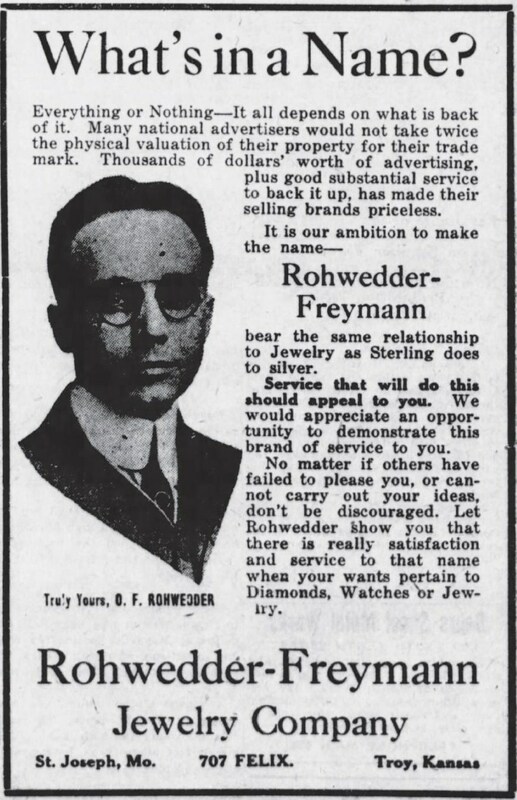 He left the jewelry business on his doctor’s recommendation when he was given a year to live during a bout with pneumonia. He spent the next year perfecting his first bread slicer design. The Maple City Stamping Company of Monmouth, Illinois was set to manufacture his slicer in 1917. But his plans changed when the building, along with his model slicer, burned to the ground. The Chillicothe Constitution-Tribune (Chillicothe, Missouri), October 4, 1922, page 20. This talk may also be where Rohwedder ran across an investment opportunity in the bread business. 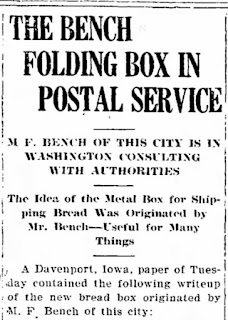 In 1920, Marion Franklin (“Frank”) Bench, a baker from Chillicothe, Missouri, received a patent for his design of a collapsible bread-box, “a sanitary bread box that would occupy a little space when empty.” In 1987, his widow described it as “a steel frame with foldable hard cardboard sides that could lay flat when not in use.” The process of bringing his bread-box to market brought together all the parties who brought sliced bread to the masses several years later. It is not clear exactly how or why, Rohwedder met Bench, but it could have been as a result of the lecture in Chillicothe in 1922. 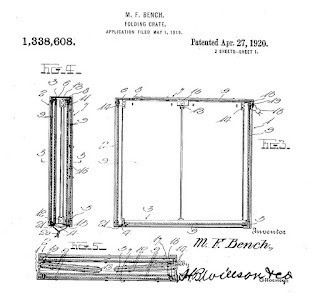 Bench was a man with an invention. Rohwedder was Vice President of an investment firm, presumably always on the lookout for new investment opportunities. 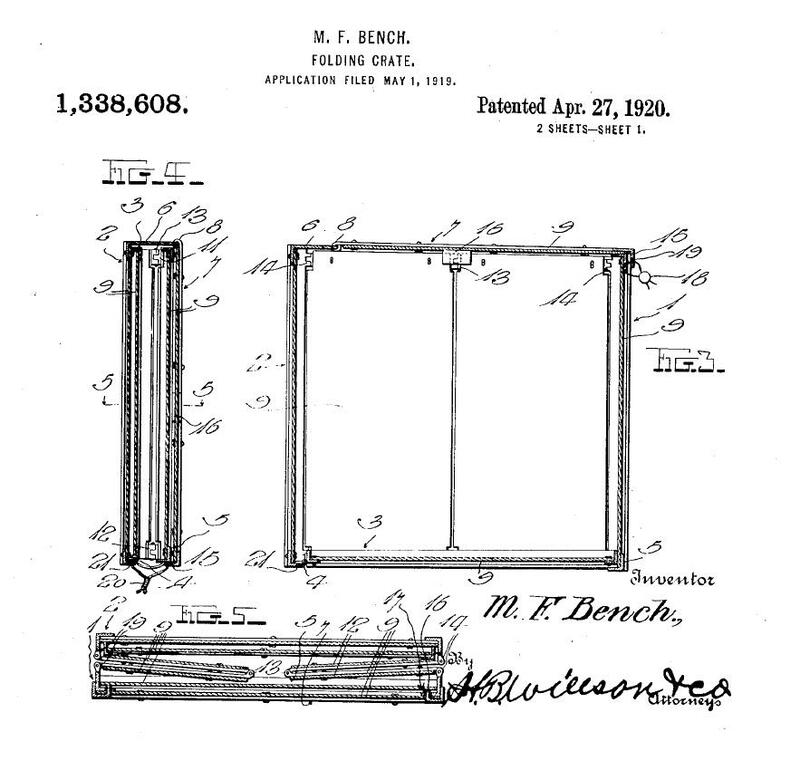 In 1923, Rohwedder invited Bench to Davenport, Iowa to prepare the design for market. They arranged manufacturing through the Micro-Machine Company of Burlington, Iowa. 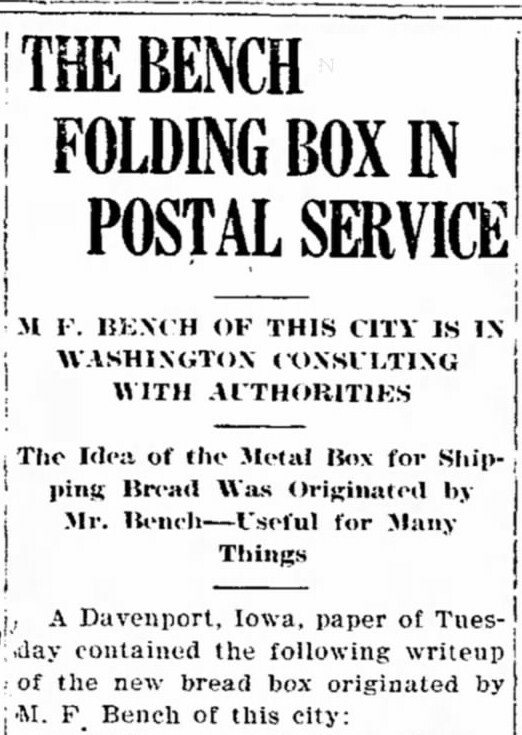 Shortly after selling their first boxes, Rohwedder and Bench were granted an audience with the United States Postal Service to discuss a presumably lucrative government contract – no news on whether they succeeded or not. Chillicothe Constitution-Tribune (Chillicothe, Missouri), November 8, 1923, page 1. 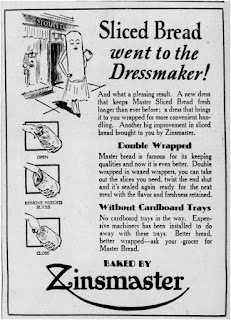 Five years later, Micro-Machine also manufactured Rohwedder’s first bread-slicing machines and installed the first one in Bench’s bakery in Chillicothe, Missouri. In an interview at his home in Michigan in 1952, Rohwedder said that he returned to work on his bread-slicing machine again in 1922 (Battle Creek Enquirer, September 7, 1952, part II, page 11). The timing suggests that his renewed interest may have been spurred by his new connections with Bench and the Micro-Machine Company, and their work on the collapsible bread box. Rohwedder eventually left his position with the investment firm to concentrate on perfecting his bread slicer. 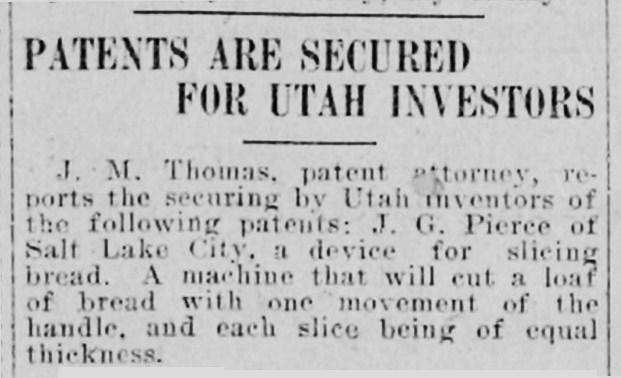 He filed his first patent application in July 1926, and later filed a series of patent applications, continuations and continuations-in-part, from which at least four patents issued, covering two types of bread-slicing machines and ancillary elements of the bread slicing and wrapping process. 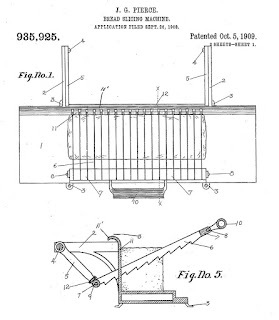 Bread-Fastening Machine, Otto F. Rohwedder, August 28, 1928, based on an application filed July 10, 1926. 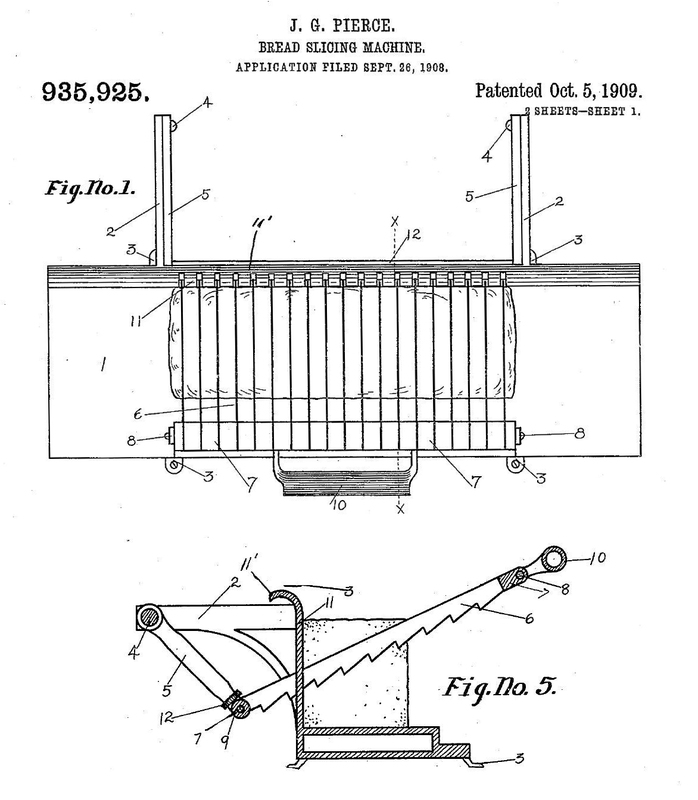 His second patent related to a “wireworking machine”[ix] that made the pins with which early loaves of sliced bread were held together. Since early sliced bread was wrapped in waxed paper, instead of the now familiar air-tight, plastic sleeve/bags, it was believed that holding the loaf together tightly with pins preserve freshness longer. 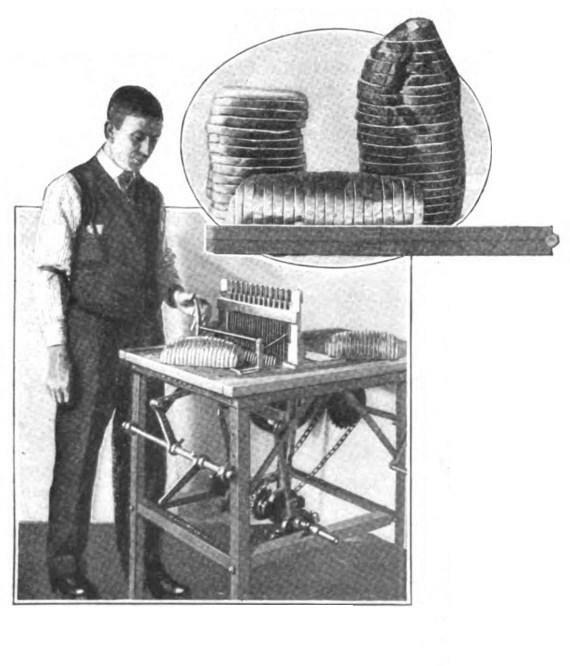 The first sliced bread machines also placed the loaves in a cardboard tray, although the cardboard was soon omitted when it was found that it imparted an unsavory taste to the bread. 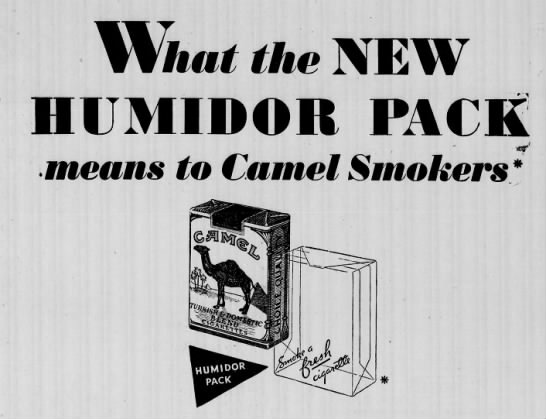 The Scranton Republican (Scranton, Pennsylvania), August 13, 1929, page 6. Star Tribune (Minneapolis, Minnesota), March 20, 1931, page 23. 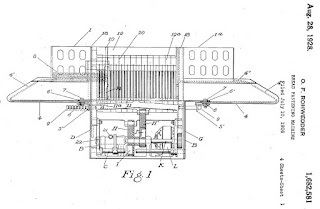 Bread Slicing Machine, US 1,935,996, O. F. Rohwedder, November 21, 1933, based on an application filed September 26, 1929 (a continuation-in-part of earlier applications filed July 5, 1928 and February 9, 1929). 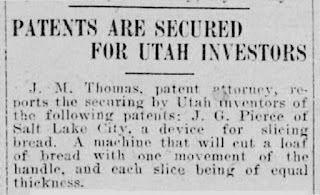 A fourth patent covered an improved bread slicer that used an array of band-saws, instead of the reciprocating blades of the first. 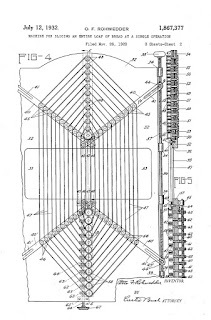 Machine for Slicing an Entire Loaf of Bread at a Single Operation, US Patent 1,867,377, O. F. Rohwedder, July 12, 1932, based on an application filed November 26, 1928. T. M. McClelland, “one of the wealthiest citizens of Davenport,” died in 1902. [xiii] His son, George, was the beneficiary of what must have been a very large trust. In 1923, George McClelland won a lawsuit to receive $80,000 of disputed trust dividends, over and above his normal trust payments. Perhaps he used this windfall to fund Rohwedder’s bread-slicing venture. Mac-Roh arranged for the Micro-Machine Company to manufacture the machines and install the first one in Frank Bench’s Chillicothe Baking Company. The Chillicothe Baking Company has installed a power driven multi-bladed bread slicer which performs a feat which heretofore had been considered by bakers as being impossible – namely, the slicing of fresh loaves. Shortly after the loaves leave the oven and prior to the time when they are sent through the wrapping machine they are sliced by the Rohwedder Bread Slicer. . . . 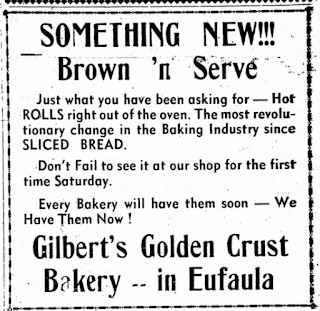 There is no crumbing and no crushing of the loaf and the result is such that the housewife can well experience a thrill of pleasure when she first sees a loaf of this bread with each slice the exact counterpart of its fellows. . . .
Chillicothe may well be proud of the fact that the launching of this service was entrusted to a local organization – the first bakers who have ever sold commercially sliced bread to the public. Does this sound the death knell of the bread knife? Perhaps not for some time. It will however remove from many homes the chore of keeping the bread knife sharp in order to cut slices that can never compared to the slices of the Kleen-Maid loaves that will be on sale at all grocers starting tomorrow. It was the best thing . . .
. . . since wrapped bread. [i] “Mixed Reaction Follows TV Debut on Pacific Coast’s Sports Scene,” Hal Wood (UPI), The Times (San Mateo, California), August 8, 1949, page 11. [ii] “My New York,” Mel Heimer, Las Cruces Sun-News (Las Cruces, New Mexico), June 3, 1949, page 4. [iii] “Billy Rowe’s Notebook,” Billy Rowe, The Pittsburgh Courier (Pennsylvania), January 29, 1949, page 20. [iv] “Stewart Granger has the Girls Swooning,” Dorothy Kilgallen, Star Tribune (Minneapolis, Minnesota), March 9, 1951, page 6. [v] “Washington Whirl,” Eloise McElhone, The Cumberland News (Cumberland, Maryland), September 5, 1951, page 7. [vi] “Radio and Television,” John Crosby, The Daily Times (Salisbury, Maryland), January 5, 1952, page 10. [vii] “Fun is Back – and Welcome – in Café Shows,” Will Leonard, Chicago Tribune, August 10, 1952, Section 2, Page 4. [viii] “Gowns have Foolproof Zippers,” Gaile Dugas, Warren Times Mirror (Warren, Pennsylvania), November 26, 1952, page 21. 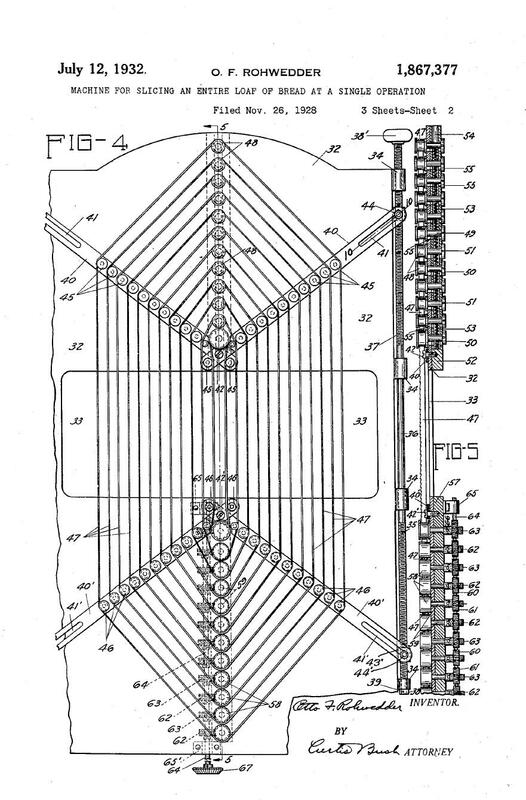 [ix] Wire-Working Machine, Otto F. Rohwedder, December 17, 1929, based on an application filed January 26, 1928. [x] Davenport Daily Gazette (Davenport, Iowa), December 3, 1857, page 1 (“[T]he plan [for the Cook and Sargent Banking Building was] submitted to the builder, Mr. T. W. McClelland, of this city, last March . . . .”). [xi] The Davenport Daily Gazette (Davenport, Iowa), April 6, 1868, page 4. 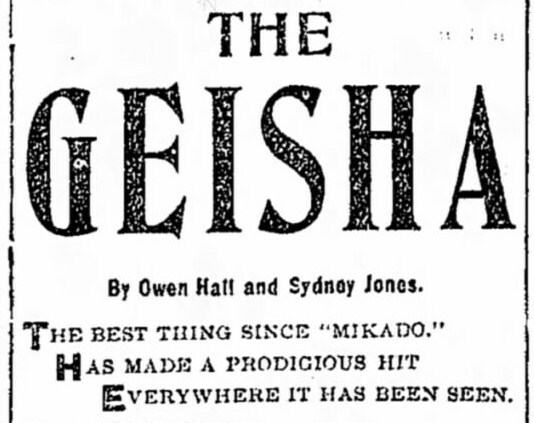 [xii] Davenport Democrat and Leader (Davenport, Iowa), March 13, 1924, page 15. [xiii] Rock Island Argus and Daily Union (Rock Island, Illinois), January 27, 1902, page 3 (“T. W. McClelland, one of the wealthiest citizens of Davenport, was found dead in a chair at his home yesterday morning, having died of heart disease.”). I really enjoyed this glance back through the history of sliced bread, the slicing machinery and especially the folding bread box. A couple of years ago, I found an older metal bread box that I still enjoy using and am surprised that they are not as popular as they once were. 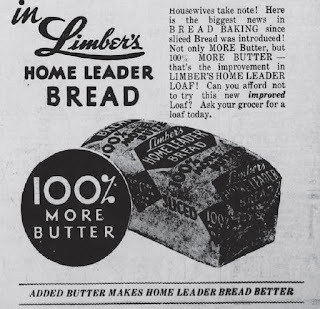 I guess we still like the convenience of sliced bread, but it's interesting that our familiarity with sliced bread causes us to greatly appreciate that less-familiar non-sliced loaf fresh out of the oven that we then thickly slice in our own kitchens and slather with 100% real butter! Thanks for all the time and effort that went into this very enjoyable post!